On November 29th the co-chair Jamez Staples and members of the Economic Development Working Group, Rob Hanson (West Broadway Business and Area Coalition), Queen (One Family One Community), and Me'Lea Connelly (Blexit) spoke at City Council's public hearing to amend the 2018 budget. Some concerns raised were the way that the City intended to allocate the Community Development Block Grant (CDBG) funds. The intention of the Minneapolis Promise Zone (MPZ) was to bring more federal funding to North Minneapolis. Since CDBG dollars are acquired through the federal government, the MPZ implores the City Council to consider directing some of those funds towards North Minneapolis. Members of the Economic Development Working Group discussed efforts they would like to be funded by the City. Some of these suggestions were the construction of a shelter in North Minneapolis, implementation of Housing and Urban Development (HUD) section 108 loan program, Clean Energy Franchise Fee, and more systems set in place for homelessness prevention. Engaging with the systems which integrally shape resident's every day lives, especially those living in the MPZ, is extremely important. The MPZ would like to thank everyone who attended the public hearing on behalf of the MPZ Economic Working Group. If you would like to be involved in similar actions you can contact Sam Calahan. To watch the public hearing click here. The Minneapolis Promise Zone manager along with two of the AmeriCorps Volunteers in Service to America (VISTA) attended the Upper Harbor Terminal Redevelopment Housing Meeting on November 30th. The goal of the meeting was to gather input from the community, residents, and organizations on the housing and small business components as well as the eventual impact of the development project. There was a panel consisting of Tim Baylor from Pinnacle Management, Angie Skildum from the City of Minneapolis, Cora McCorvey, former CEO of MPHA, and Sarah Larson from Landon Group. The panel was facilitated by Shauen Pearce-Lassiter from Greater Minneapolis. The panelists’ discussion centered around two topics: affordable housing trends in Minneapolis and potential tools to create and encourage affordable housing. The first topic of discussion centered around how there is a large renter population in the city of Minneapolis (especially in the North Minneapolis Promise Zone), and their income has steadily declined while the cost of housing has increased. The second topic of discussion addressed this challenge, as well as how racial disparities persist due to the legacy and complacency toward inequitable policies. Potential tools for creating affordable housing discussed included the city’s affordable trust fund, which subsidizes costs associated with development to incentivize affordable housing, as well as private activity bonds (tax-exempt housing residency bonds). Challenges discussed included overcoming organizational and institutional challenges such as: avoiding subtle red-lining by over-incentivizing affordable housing, and raising land values. Replicating programs from other states/cities was also discussed, like Atlanta’s tax freeze for areas experiencing or undergoing gentrification. 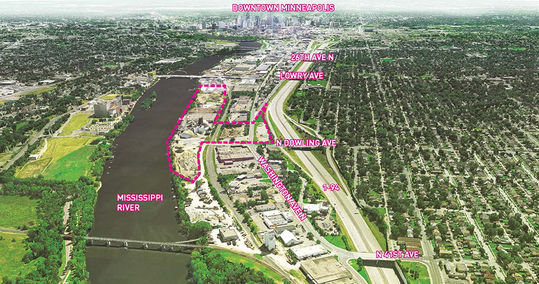 Residents of North Minneapolis can keep updated on upcoming Upper Harbor Terminal meetings to hold the city accountable for developing equitably in North Minneapolis. 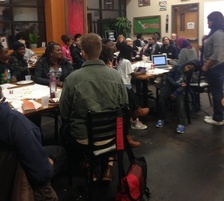 On November 27, 2017, Northside Fresh hosted the Northside Fresh Bucks FINI Visioning Session at Breaking Bread Café. In attendance were staff from the City of Minneapolis, Appetite for Change, Project Sweetie Pie, cohorts from the University of Minnesota, and proactive local Northside farmers. Local partners and residents in the meeting came together to determine what type of nutrition incentives will best serve Northside residents. One of the strategies deliberated was the Food Insecurity Nutrition Incentive, (FINI). FINI is a Grant Program that supports projects that increase the purchase of fresh produce among low-income consumers participating in the Supplemental Nutrition Assistance Program (SNAP). SNAP, using federal funds, provides incentives to reduce the cost of food for qualifying low income consumers. This expands the customer’s ability to purchase healthy, local food. The group voted on most effective methods to incentivize consumers to buy healthy food. Some examples were a percentage off, a discount off of every $10 dollars spent, and cents off per dollars spent. The group decided that the most effective way to make food more affordable for low-income populations was to take off cents per every dollar spent. Attendees working on projects surrounding food also discussed the application process for United States Government Department of Agriculture (USDA) federal grants.Fortunately any organization that falls within the Minneapolis Promise Zone (MPZ) boundaries is able to get preference points for their application, increasing the likelihood of being selected. If interested contact Julianne Leerssen for further inquiries. You must attend a workshop before you can participate in the NACA program. Sat, January 6: 9:30 a.m.-2:30 p.m. The contract will be available through an open Request for Proposals process. Applications are due by 8 a.m. on Friday, Jan. 12 to kmongoven@caphennepin.org. Access the RFP. There will be an informational meeting on Tuesday, Dec. 19 from 9-11 a.m. at North Regional Library. Tues, December 12: 2-5 p.m. Wed, December 13: 11:30 a.m.-1 p.m.
Mon, December 13: 6-8 p.m.
Fri, December 15: 10:30 a.m.-3 p.m.